Long before there was refrigeration, man was making cheese. Somewhere along the line, caves were discovered as the perfect place for aging cheese. Caves provide constant temperature and high humidity that keeps cheese from drying out. What's more, cave-aged cheese acquires some of the unique taste and smell of the cave, resulting in bigger flavor and more complexity. This cheese has been made for about 700 years. There are about 75 Swiss dairies that produce this fruity cheese with a strong aroma. Each dairy has its own secret recipe for brining the cheese, which includes herbs, spices, wine and cider. 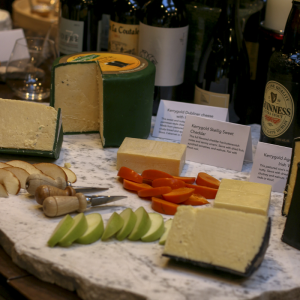 Serve appenzeller with summer fruits, merlot or pale ale. Gouda is one of the oldest cheeses in the world, with written records dating back to 1184. Traditionally, Dutch gouda was made by women and cheese-making skills were passed down from mother to daughter. Gouda comes in six categories, from the youngest 4-week old cheese which is called "very young," to the oldest gouda which is called "very old." Very old gouda is at least one year old and can be aged as long as eight years. Aged gouda is both salty and sweet with a strong sense of butterscotch, and wonderful crunchy bits of crystalline imbedded in the cheese. Serve with mustard, apples, strong pale ales and port. In the Netherlands aged gouda is often served with a sprinkle of sugar or a bit of apple syrup. Gruyère is a beautiful cooking cheese that I routinely use in gratins and French onion soup. Cave-aged gruyère, is wonderful on a cheese platter. The best gruyère is Le Gruyère Premier Cru, which is cave-aged for 14 months. This cheese has won the "Best Cheese in the World" award on four different occasions. Put it on your bucket list! This raw cow's milk cheese is hand-crafted in Colchester, Connecticut. It is brined and caved-aged for 60 days. 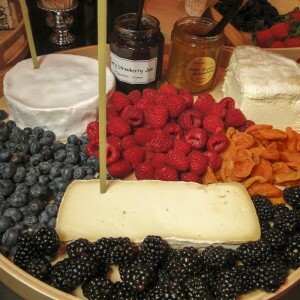 It is delicious with sparkling wines and fresh fruit. Hand-crafted in Bergano, Switzerland, by a 3rd generation cheese family, this cheese is made with cow's milk and cream and aged 365 days. Scharf Maxx means "extra sharp," and describes this cheese well. It has a potent onion and hay aroma and flavor. 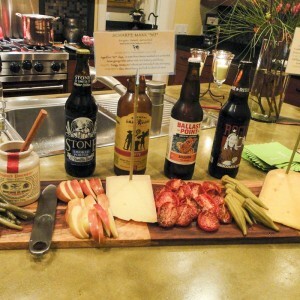 Pair with brown ale, wheat beers and full-bodied red and white wine. I like to serve cave-aged cheeses with a good mustard, such as whole-grain Pommery mustard, cornichons and other pickles, slow-roasted tomatoes, apples and salami or other cured sausages. 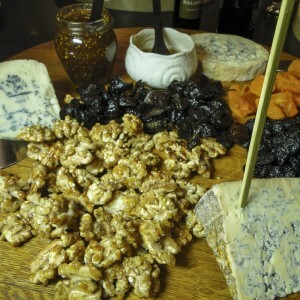 Cave-aged cheese platter with pairings. Place three cheeses on a platter and surround with cornichons, pickles, slow-roasted tomatoes, sausage and serve with mustard.